Plessy water fountains have been covered with plastic since last week, when an off-the-shelf test, performed by a student, came back positive for contaminants. District Communications Director Tania Dall confirmed the plan. The district doesn’t know if it has a lead-in-water problem. But after the health crisis over lead in Flint, Michigan’s water supply became public, the Recovery School District and Orleans Parish School board promised to test water in all New Orleans public schools. That never happened. They decided installing filters was a more permanent solution, but it’s been a slow process. Filter installation was originally set to begin in the fall of 2017. That was delayed by a year, to the fall of 2018. Installations won’t be finished until early next school year, district officials told The Lens in February. As of this week, 33 district buildings have filters installed, less than half the city’s public schools. The young scientist at the center of this story is 13-year-old Bernard Voss-Potts. He goes by “Berr.” In preparation for an NPR podcast challenge, he decided to test the water at Plessy. 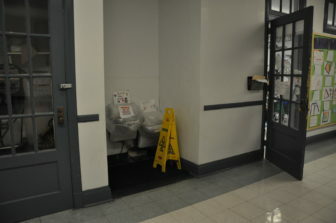 After his test indicated the presence of lead and/or pesticides, staff shut off drinking fountain access and the district brought in bottled water. District officials have not responded to questions about whether plans are in the works to provide bottled water to any of the other schools that have yet to receive filters and where testing has not been done. Raychaudhuri noted last week that Berr’s test didn’t necessarily meet lab-level standards. But it certainly got the ball rolling. When the district’s contractors went to install filters Monday, they learned water pressure at the school was too low to do so. The district then placed an emergency order for the booster pumps. Last month, a district spokeswoman said that “roughly 16 schools” need booster pumps before filters can be installed. A spokesman for the Sewerage and Water Board of New Orleans said the utility was not aware of low water pressure in the area. “The closest gauge to this school is located near the Municipal Auditorium,” Curtis Elmore wrote. “It’s average water pressure typically stands around 44 to 45 psi,” well above the state minimum of 20. In an interview with The Lens, Berr said that he saw workers putting in filters this week. Jon Voss, Berr’s father, said he’s proud of his son. “Obviously we’re excited to see this response, but as Berr said … there’s the frustration of why they haven’t done this system-wide,” Voss said. “The other side of this story, that we’ve learned so much about, is the power of young people and the importance of a school encouraging that method of scientific inquiry,” Voss said. Berr said he and his teacher were thinking about bigger plans for their inquiry. Orleans district promised Monday installation at Plessy after a test performed by a student found possible contaminants. But the filters won’t work properly without booster pumps. The district says about 16 schools need the pumps.